Boulder Food Rescue recently surpassed over “million pound mark”! 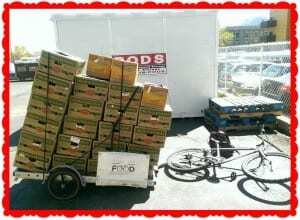 Since our start in 2011, we’ve rescued over 1,000,000 pounds of (mostly) fresh produce using 85% percent bike pow er. We’d love to take this chance to thank all of our amazing volunteers, donors,recipients, and community partners for collaborating with us!! Come celebrate with us and the wonderful residents at Canyon Pointe as we cook and share a meal together in celebration. Cooking starts at 10am and lunch is served at noon. Joining us will be the smoothie artists from Fruitera Smoothies.